International Game Technology has been responsible for many of the innovations in slot game play that we take for granted nowadays. They have been creating games for live casinos since the 1980’s – and more recently have moved online. Da Vinci Diamonds not only has a quirky and imaginative theme (combining the inventor / painter Leonardo da Vinci with a gems type game), it has a significant innovation which is now prevalent in games from many different software houses. This was the first slot to use the tumbling reels concept. You will also find multiple scatter symbols – and a free spins game (with different symbols) which really goes all-in with the classical theme! This page gives you a detailed overview of the Da Vinci Diamonds slot – starting with the innovative game play and then covering the visual and audio aspects of the game. You’ll find a standard 5 reel video slot grid, with 3 rows of symbols on each reel. There are 20 win lines (this number is fixed, though you can play multiple coins per line and adjust the coin value too). Your first impression might be that the gems and classical painting symbols are mismatched – that the theme does not quite fit together. Once you start to spin you will quickly encounter the main difference between Da Vinci Diamonds and other slot games – tumbling reels. Here is how it works: When you hit a win (anything from 3 of a kind from the left on a win-line), the symbols explode and disappear. This creates gaps in the reels, which the other symbols fall down into. New symbols appear to fill the resulting gaps at the top of the reels. One win is already booked before this happens, and with the symbols falling more wins can be created. If so, then they will also explode – and so on. Potentially you can land many wins in a row (though in practice this is usually 2 or 3). Many of the painting symbols are scatters. These pay out regardless of where on the reels they land, based on the total number in view. Having a lot of scatters (on top of lining up the regular symbols) gives more potential for sequences of tumbling reels – especially during the free spins bonus game. For example, you might hit 4 paintings and 3 gems at the same time – leaving a lot of gaps when these explode for new symbols to fall into. There are also wild symbols in play. These will substitute for any of the regular gem symbols, though not the scatters. Unfortunately the wilds disappear when you make a win with them by exploding along with the other symbols. I’ll look forward to seeing a bonus game in a future version of this slot where the wilds stay in place! One more symbol is used to trigger the free spins bonus round. Initially 3 or more of these will trigger 6 free spins – though as you will see below you can then retrigger variable amounts of spins depending on how many you get. The reels change color and some stirring violin music kicks in for the free spins game – you will also find some different gems on the reels. Game play is the same, with the tumbling reels the main focus. You will see a scoreboard type panel below the reels keeping track of your wins and remaining spins. What you want to see during this feature round is the bonus symbols. These can extend the free spins game by a significant margin – and have a twist of randomly awarding extra spins based on the total number of bonus symbols in play. 3 bonus symbols gets you 2, 3 or 4 extra spins – 4 gets you between 8 and 10 spins and the maximum 5 bonus symbols gets you between 6 and 15 extra spins. There is a maximum of 300 free spins for each feature. This slot really does look like one of those mobile phone gems games on first view. It was created before phones capable of running those even existed – and the shading / graphics do show this on closer inspection. What stands out the most is the juxtaposition of classical paintings with the brightly glowing gems. You’ll find the Mona Lisa, one which could be Leonardo himself and several others on the reels. Audio includes a glass like tinkling when the reels stop and a slightly haunting electronic tune when you hit a win and the symbols are about to explode. When you hit the free spins, you’ll get the full-on classical music experience instead. How does Da Vinci Diamonds Compare? With so many games now employing tumbling reels, the main reason to play this game is no longer I place. What you will find is that famous solid IGT game-play (this game started out life as a live casino slot), along with a free spins round that can be extended for a long time. 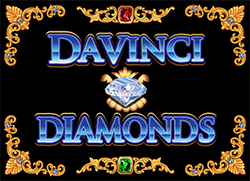 Da Vinci Diamonds is an important piece of slot history which brought with it a great new innovation – I recommend that you check it out for yourself.